Nominate a nurse for a DAISY award today! 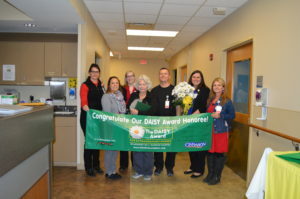 Greene County General Hospital is proud to recognize our nurses with The DAISY Award For Extraordinary Nurses, a national program that honors the compassionate care and clinical excellence our nurses bring to their patients every day. Throughout the year, you may nominate a nurse for The DAISY Award by simply filling out the form and mailing it to Greene County General Hospital, 1185 N 1000 W, Linton, IN 47441, ATTN: DAISY Coordinator.  The not-for-profit DAISY Foundation is based in Glen Ellen, CA, and was established by family members in memory of J. Patrick Barnes. Patrick died at the age of 33 in late 1999 from complications of Idiopathic Thrombocytopenic Purpura (ITP), a little known but not uncommon auto-immune disease. The care Patrick and his family received from nurses while he was ill inspired this unique means of thanking nurses for making a profound difference in the lives of their patients and patient families. DAISY is an acronym that honor’s Patrick’s ordeal, standing for Diseases Attacking the Immune System. 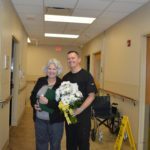 Each year, a nurse will be selected by Greene County General Hospital’s nursing administration to receive The DAISY Award. At a presentation given in front of the nurse’s colleagues, physicians, patients, and visitors, the honoree will receive a certificate commending her or him for being an “Extraordinary Nurse.” The certificate reads: “In deep appreciation of all you do, who you are, and the incredibly meaningful difference you make in the lives of so many people.” The honoree will also be given a beautiful and meaningful sculpture called A Healer’s Touch, hand-carved by artists of the Shona Tribe in Africa. Christine “Tina” Smith was nominated twice by colleagues who expressed a deep appreciation for the attention and dedication she provides every day. Congratulations Tina! We are pleased to announce the implementation of our non-nursing Employee Recognition Program that will recognize full and part-time employees of Greene County General Hospital, Greene County Home Healthcare and Greene County General Hospital, LLC for their performance, dedication, and diligence in carrying out their duties and in advancing the goals and mission of the Hospital. The PETAL employee recognition program will identify employees who serve as models to the community for professional achievement and reinforce Greene County General Hospital’s commitment to recognizing outstanding performance. The PETAL award will be given annually to a non-nursing employee who exemplifies extraordinary service in the performance of their job. The PETAL award was established for non-nursing staff to align with the DAISY award for nursing staff. We want our programs to work hand-in-hand, as we know the overall success of our Hospital and award winning care of our patients, rests in the hands of each of our employees. The PETAL Award will be given in tandem with the DAISY, in February, May and September each year. How did this employee impact your stay, visit, work at the hospital?  Describe a situation where the employee went above and beyond the normal scope of their position. Share an example where the employee provided exemplary service. You can find the nomination form at the top of this page, or look for PETAL Award stations throughout the hospital.